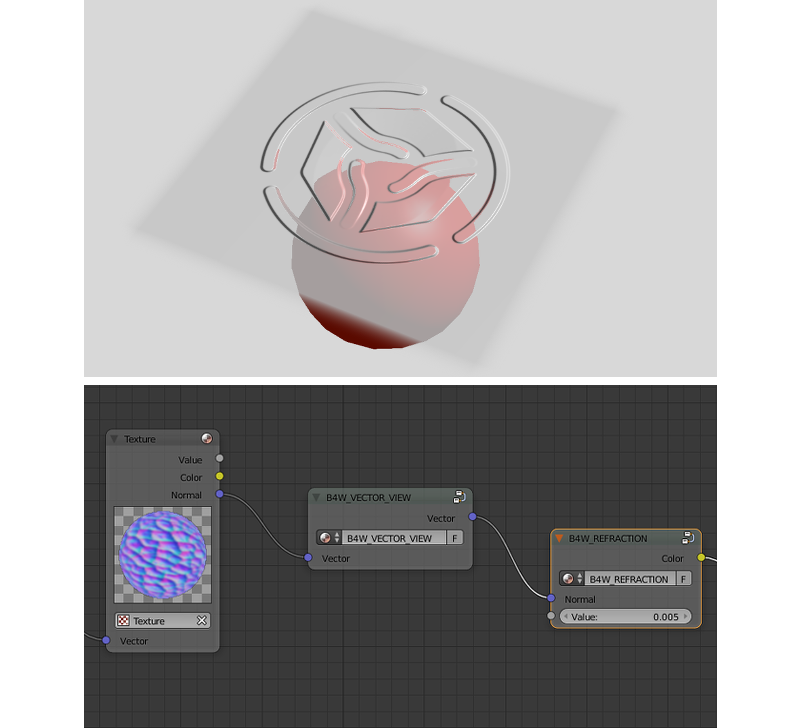 Shader nodes extend significantly the potential of Blender’s standard materials by means of presenting shading as a batch of basic transformations. 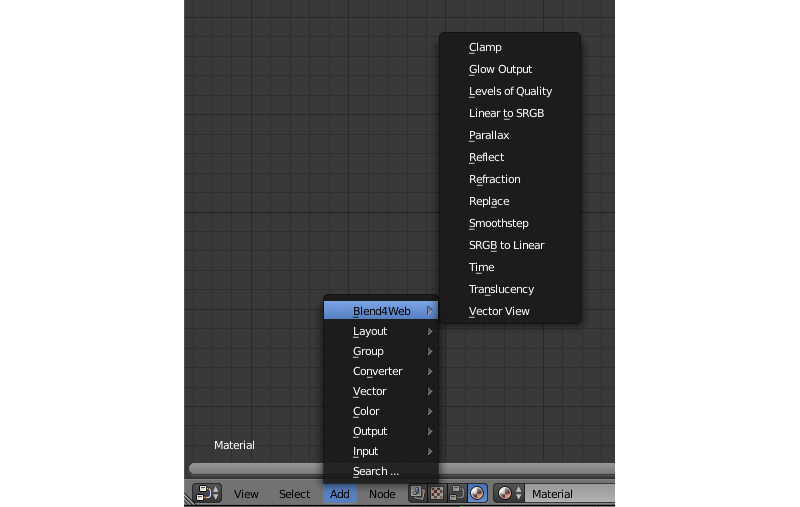 Blend4Web supports all standard Blender nodes, but some of them do not work fast enough and are not recommended to use in real time applications. Creating very complex materials, especially using large numbers of Geometry and Texture nodes, is also not recommended. The engine also has partial support for some of the Cycles nodes. This subject is more thoroughly described in the corresponding chapter. Standard node performance and degree of support is described in the table. 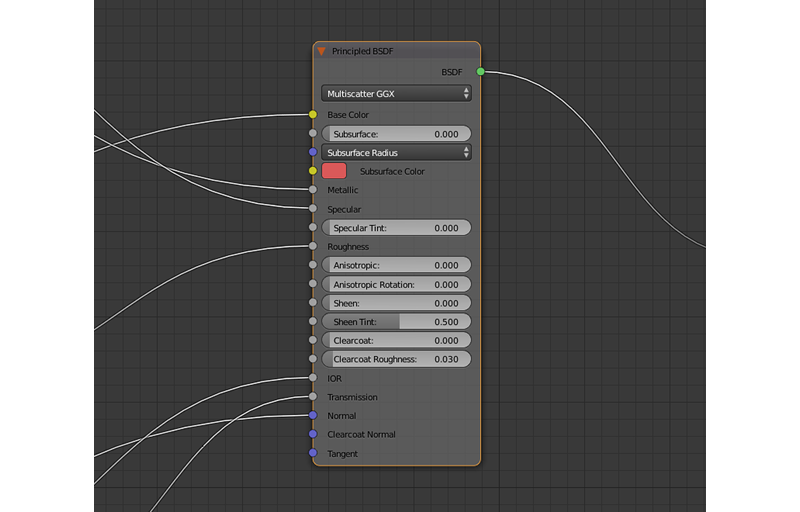 The Color Space parameter of a normal map used with this node should be set to Non-Color. Not doing so may lead to unpredictable results (although it won’t crash the engine). If at least one of the internal parameters, Space to convert from... or Space to convert to... is set to Object, then any object that uses the material will be considered dynamic. Please keep in mind that node materials have certain limitations concerning the number of specific nodes in the material. These limitations are described here. Engine-specific nodes extend functionality of the standard nodes to support extra features. These nodes are created as node groups (Node Groups or Node Tree) with specially determined names and input formats. For convenience, all special nodes are added to a blend file when it is opened. The node limits the output value. As a result all the output vector components take values from 0 to 1 inclusive. 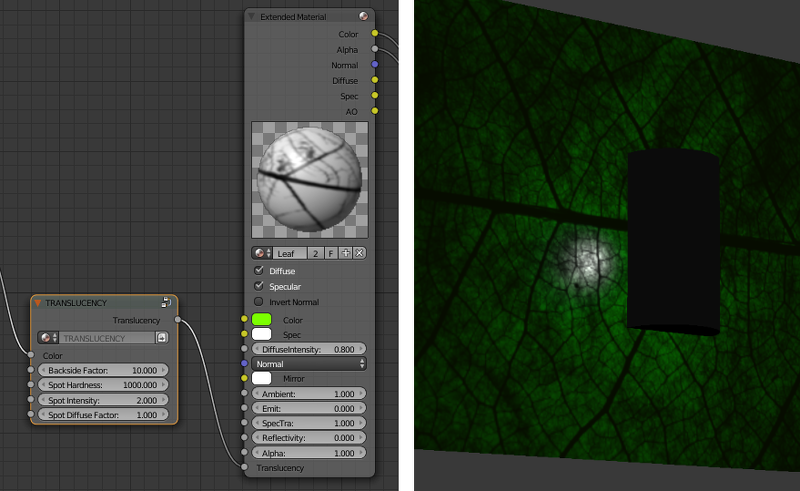 Applies the Glow effect to the node material. 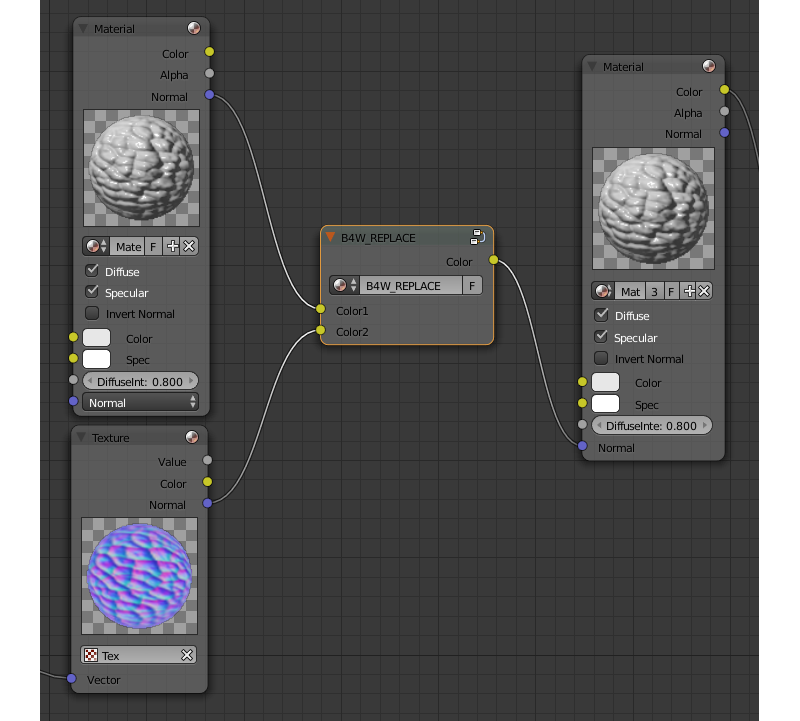 Besides the B4W_GLOW_OUTPUT node, the node material should have the Output node. Glow ratio. Factor \(\in [0, 1]\). Factor = 0 - no glow. Factor \(\in (0, 1]\) - there is a glow, colored with Glow Color. Sets up the output color based on the current image quality settings. Can be used to, for example, replace complex material with more simple one if the application is running on a mobile device. Node links this parameter to Color parameter in case of high and maximum quality usage. Node links this parameter to Color parameter in case of low quality usage. This value specifies what quality setting (HIGH or LOW) will be visible in the Blender viewport. Can change from 0 to 1. If the value is lower than 0.5, the HIGH setting will be visible, if it is 0.5 or higher, the LOW setting will be visible. The node implements the texture coordinates offset using a height map. RGBA texture with a height map packed into the alpha channel. The number of steps for iterative generation of texture coordinates offset. The bigger this value is the better is the final quality. Maximum distance from camera at which the effect is observed. 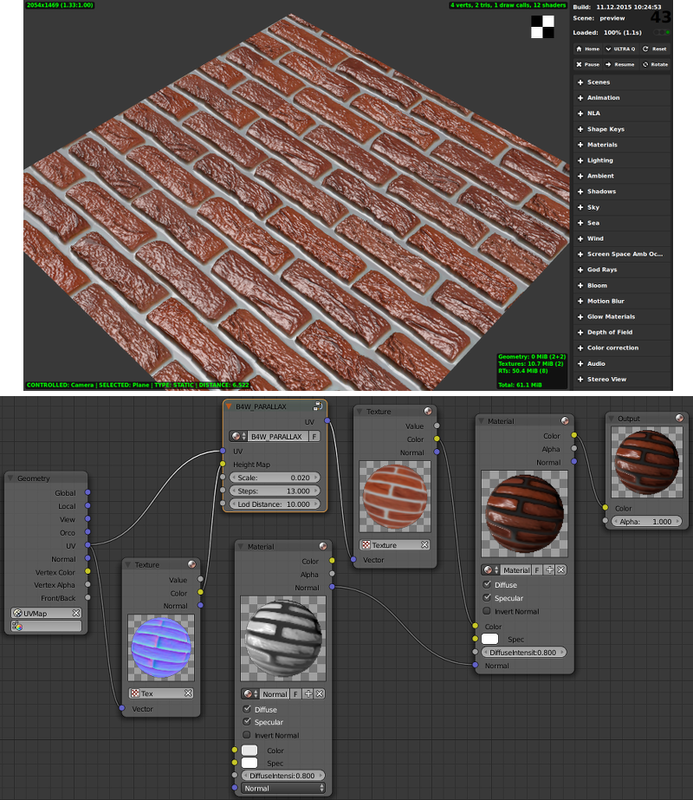 Resulting texture coordinates which are used as input for the texture nodes. Calculates the reflection direction for an incident vector and a normal vector. Can be used to apply a cubemap to an object. Incident vector. Should be connected to the View socket of the Geometry node. Normal vector. Should be normalized in order to achieve the desired result. Should be connected to the Normal socket of the Geometry node. Reflected vector. Should be connected to the Vector socket of the Texture node that contains the cubemap. Applies refraction effect to an object. This effect works only in the Blend4Web engine and not in the Blender’s viewport. A normal vector in camera space for adding perturbations. Rendered texture behind object with perturbations. 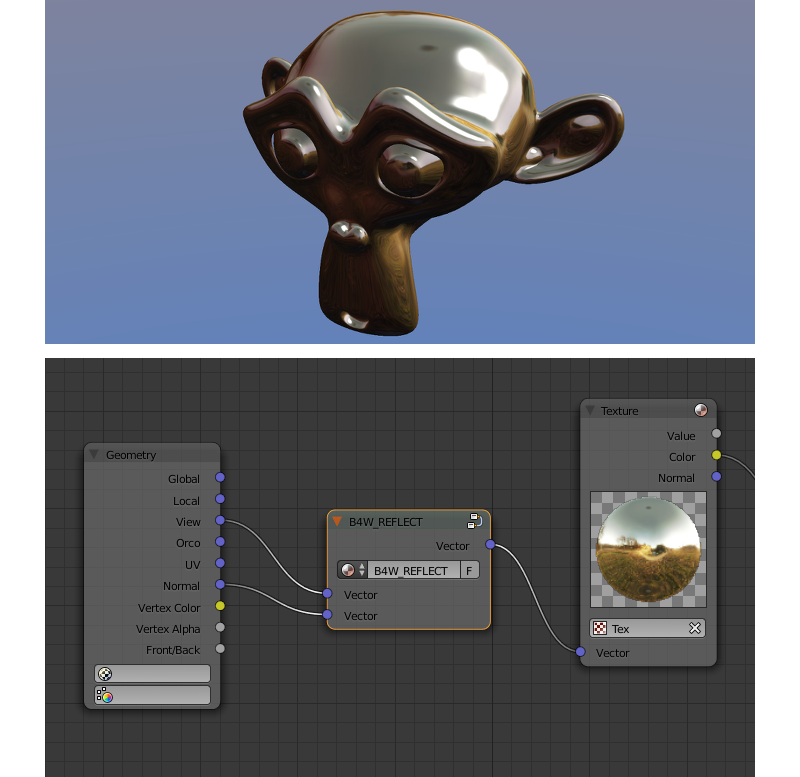 It’s necessary to set the Refractions option from the Render > Reflections and Refractions panel to value AUTO or ON. The object’s transparency type must be set to Alpha Blend. The node replaces the inputs depending on the working environment (i.e. Blender viewport or Blend4Web). When working in Blender the Color1 input is connected to the Color output and the Color2 input is ignored. On the contrary when working in the engine the inputs are interchanged (the Color1 one is ignored and the Color2 one is connected to the output). The node is intended to display one node structure in the viewport and another - in the engine. As a rule it is used for normal mapping. Blender’s node materials do not support a tangent space of coordinates. Therefore, the only possible method to display normal maps in the viewport correctly is their usage inside the Material nodes. Node setup that will be visible in the Blender viewport. Node setup that will be visible in the Blend4Web engine. Should be connected to the Color socket of the Material or Extended Material node. Performs smooth interpolation between two input values based on first value. Value which determines interpolation smoothness. For the correct interpolation input Value had to be between Edge0 and Edge1. Provides the timeline counting from the engine start (in seconds). Can be used for animating any parameters in node materials, such as UV coordinates, mixing factors, transparency etc. Time (in seconds) elapsed from the engine startup. The node implements a translucency effect (with respect to light sources only) for thin objects such as cloth, leaves, paper etc. The effect consists of two parts: 1) brightening of the object side which is opposite to the light source and 2) appearance of a light spot right in the light source place. One-channel texture which defines material heterogeneity - the white color denotes maximum translucency effect while the black color denotes its absence. White color is used by default. Material color correction coefficient for the side which is opposite to the light source. It describes the color richness effect for the translucent areas. Light spot blurring factor. The bigger this value is the smaller is the spot and the sharper are the spot edges. The default value is 1000. Light spot intensity. The bigger this value is the brighter is the light spot. The default value is 1. Material diffuse color influence on the light spot color. The output should be connected to the Translucency input of the Extended Material node. This node can work incorrectly, if the mesh normals were edited. The node transforms a vector into the camera’s space of coordinates. Transformation is necessary because the engine defines most vectors in the world space of coordinates. 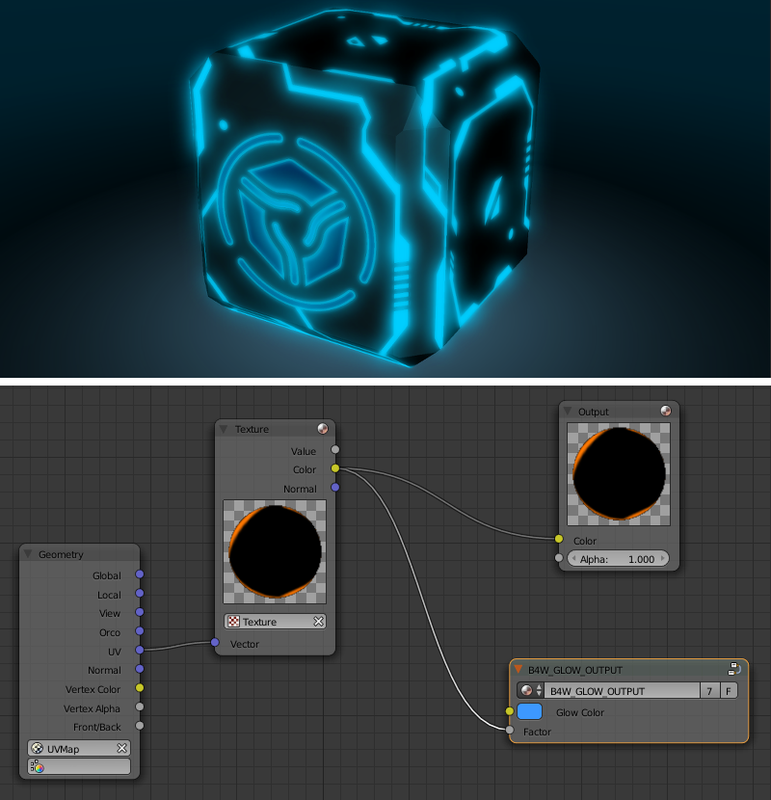 If normal vector is being transformed by this node it should be used only for effects and not for connecting to the output of the Material or Extended Material nodes. Vector coordinates in the world-space. Vector coordinates in the camera-space. Converts colors from linear space to sRGB or vice versa. This function has been declared deprecated since the version 15.04. In the newer versions, the native Gamma node with the value of 2.200 should be used to convert color from sRGB to linear space, and the same node with the value of 0.455 to convert color from linear space to sRGB. Cycles node support is an experimental feature that is not yet recommended for using in production environment. 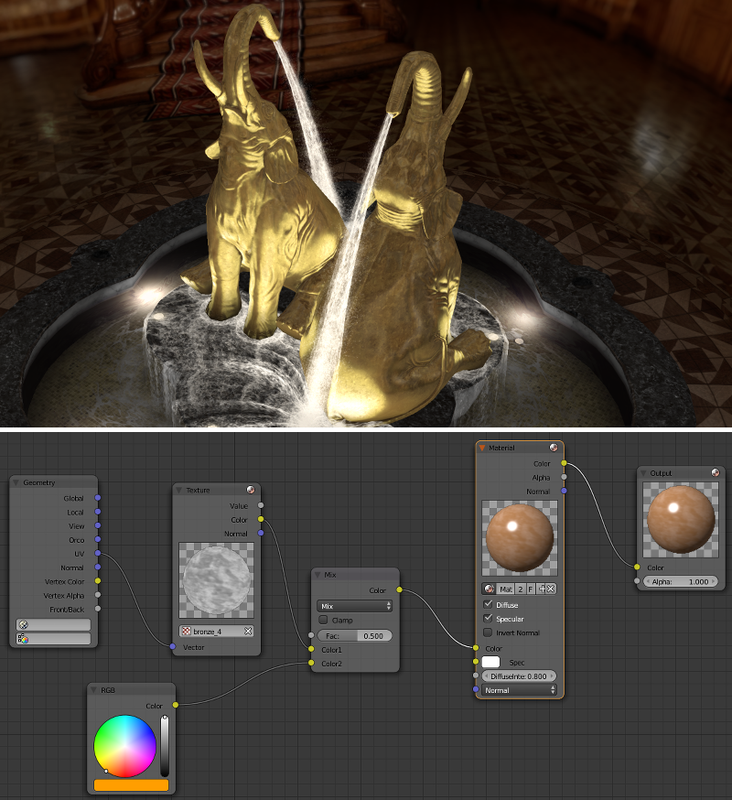 It should also be noted that using Cycles nodes in Blend4Web will produce images similar, but not identical to the ones created using Cycles renderer itself. Geometry (the Pointness and Parametric parameters are not supported). Emission (does not influence the lighting of the scene). Cycles nodes are also supported for World object. However, at the moment node material does not affect the colors of the environment. 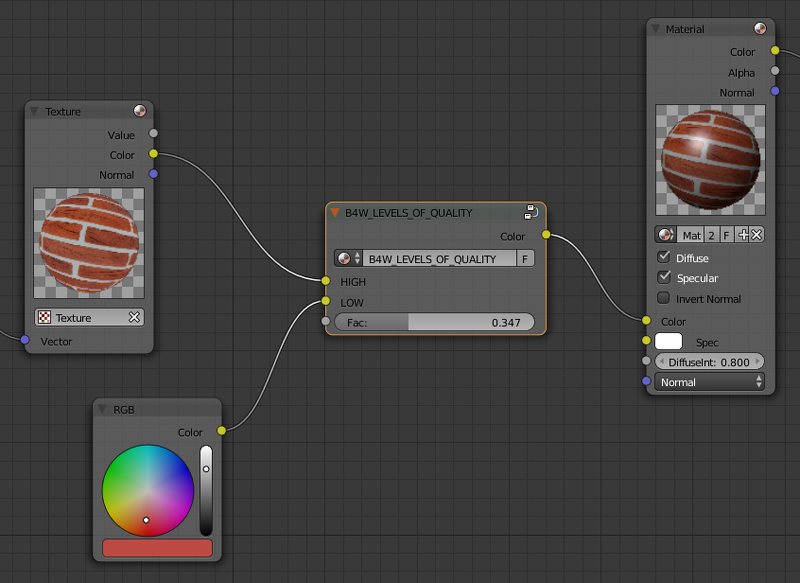 Other Cycles nodes will not, in most cases, work in Blend4Web the same way they do in Blender. They also might not work at all or even cause material in which they are used to work incorrectly. However, using these nodes will not cause instabilities in the application workflow. Node materials can be complex, but their complexity is limited by the capabilities of the hardware you use. It might not be noticeable most of the time, but if you are making a very complex material, you might exceed the number of textures and varying vectors (vectors that are used by a vertex shader to hand over data to a fragment shader) that your system allows to use in one shader. And even if you won’t, some users of your application might not have devices as powerful as yours, so they can experience problems where you will not. If you want to know how your scene would behave on a low-end device but don’t have one in your possession, there is also a very useful option called Min Capabilities Mode. It is native to Scene Viewer and can be found on the Tools & Debug panel. The number of textures and varying vectors supported by your device can be viewed on the WebGL Report web page accessible from the SDK Index page. The two following tables list various material nodes along with the numbers of textures and varying vectors the engine allocates to them.